Now DarkPlaces is not crap. Have you actually seen what it can do? Also have you seen scar3crow's screenshot's of DarkPlaces ? Icer wrote: are you calling me a noob dumbo? i only suggested this, the last time i checked this was the SUGGESTIONS FORUM right? so get over it. The TF community brings this constant engine harrassment on itself. That's a little sad people. Transfusion should'nt have to go to other projects to show off DP. I know all you blood types out there are a little nervous about 8 bit textures on DP but cmon'! Most of the pics up now are from Transfusion 0.87! Is it Pain Keep that has that awsome little MP map? You know, the castle with all the tight little corners and creepy lighting. If you get that map on q3 format, change the lighting color from white to orange or red. Give frikbot some new high poly axe zombie cloths to wear- damn that would make for some fine screens! Last edited by Zardoz on Sun Jun 18, 2006 09:25 am, edited 1 time in total. It's a little pointless to show off the full extent of DarkPlaces in regards to what we are doing with Transfusion. To keep the feel of Blood we really want to redo it as close to the original as possible, it elimiates alot of "but that wasn't in Blood!" critiques. I'm of the opinion that when people suggest we do Transfusion on Source or Unreal etc. they are really sugesting that would like to see Blood redone with hirez texures and more realistic map architecture. Honestly, I'd like to see Blood redone ala hi-rez as well, but I also want to see it done as close to the original as possible. I say, make Transfusion as it is being made already. Honestly simply having new maps being made with more detail in the brushwork and more attention to lighting will go so much farther than texture resolution could. Period. 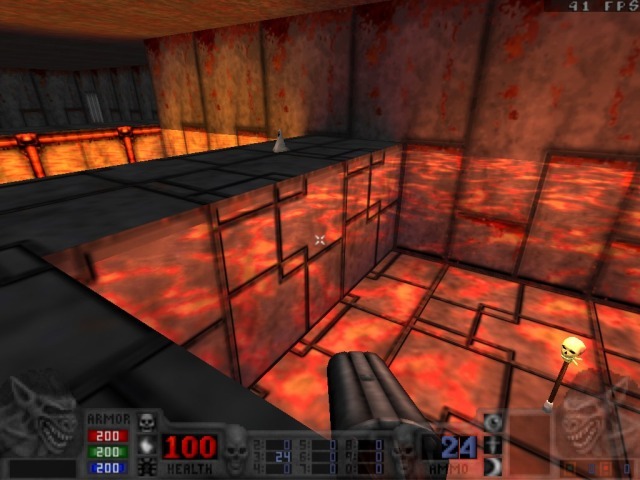 Personally, if I was remaking a Blood map... it wouldnt be true, not out of disloyalty or some such, just that... for example the outside of the funeral home in e1m1, I would consider its final geometry to be the basic showcase for the brushwork of the actual map. But that is something to do for an addon episode if someone wants to do, create more of the Blood universe with finer brush work. You just rephased what I just said... did you only read the first and last lines of the paragraphs? The idea would be to push the limits of what DP can do. Except that beyond enhanced architexture and lighting, I'd realy like to see well places examples of normal mapping. (The light debth illusion you see with the Doom3 and new Unreal engine demos, for thoes who dont know.) Stone carvings, tree bark, things of that nature. Zardoz, the reason I posted screenshots from other Darkplaces games is that I assumed Icer had already played Transfusion and thought that the graphics in Transfusion were already pushing the limits of DarkPlaces, when in fact they aren't using bump maps and all that great stuff. 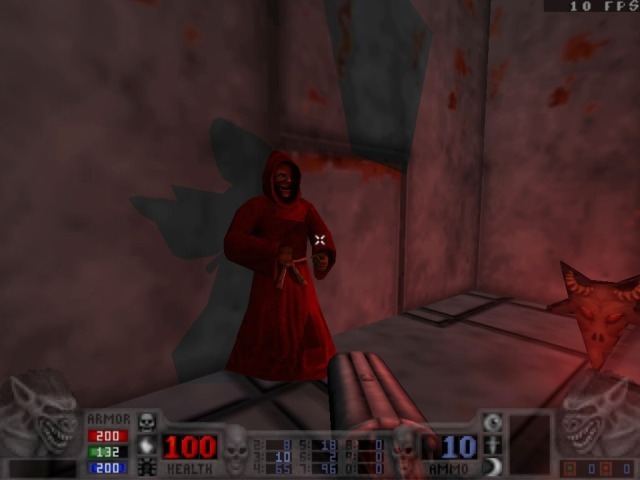 Cruaich - Not quite, I was speaking of creating entirely new levels in the same spirit and atmosphere as Blood in Transfusion with a finer attention to detail, in the same vein that the Quake mission packs had more detailed levels than the id maps. Ah, I see. I'd like to see e1m1 fully redone myself. It'd be familular territory for thoes comparing the old and the new. Boss: Yeah, hi-rez remakes can be done really bad. But that's genearly due to the fact that most of the time they get the priorites between the old and the new mixed up. They want it both, but have a hard time drawing the line. Blood has the advantage that it's not nessisaraly a fictional environment. What I mean by that is there ARE grave yards, and train yards, and carnivals etc. Plenty of sources you can draw from to make it look real. 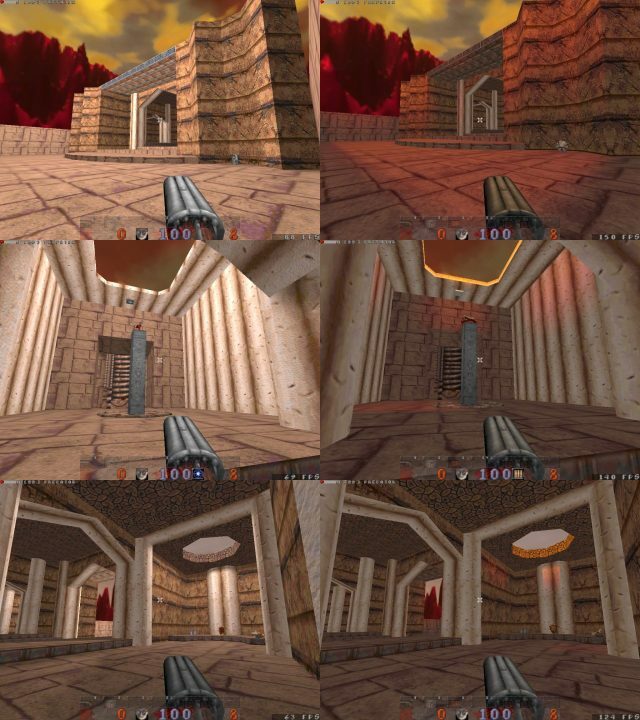 Doom and Quake hi-rez remakes have to relly on imagination to fill in the environmental details. Unfortunatly that can lead to either to much or to little. Transfusion isn't currently pushing the limits of DarkPlaces, so it therefore wouldn't be pushing the limits of any other engine. DarkPlaces is completely free and open and versitile, and gives us room to expand beyond the Blood remake project if we wish. It isn't bound by requiring any other game (even Blood oddly enough), and we have all the tools we need for it, and the few people working on this project don't feel a change would be beneficial. Yes, there will eventually be content beyond that of what was in Blood, and it won't be as bound, but that is for when we get there. Hmm, that would certainly make for awsome screen shots. To be honest I'd rather hide the texture flaws with good ol' q2 colored lighting. It's quicker and eminantly doable. remember the screen shots on the coverbox for b2? That was all done in red lighting- cranked up those expectations the first time you saw it I bet. I agree. I'm just thinking in terms of how the maps look in 3d lighting. In mapedit the mapper can alter the appearence of a tile from + x number to -y number. In otherwords every single tile in blood has been altered from its average. when a transfusion mapper slaps converted tile 0222 on some vertices, its simply the *averaged* tile from blood. So no- Transfusion will never *feel* like blood. I'm no fan of depth lighting, bump mapping and so forth. I'm just trying to get some cool screenshots! Why am I trying to tell you this stuff- you know dp and build better than I do! A few years ago, when I first played TF, I also thought DP is obsolete. But after I played Nexuiz, and I saw the Zymotic screenshots, I loved it. It has its own skeletal animated model format, it supports advanced shader technologies, it can render beautiful HDR and bloom, it supports MD3 models, it supports bump mapping, and it has a loads of other great features. TF now looks ugly because it's currently uses the old 8 bit Blood textures and sprtites, it uses the old Q1 map format compiled with the old Q1 lightmapper, and it has extremely low-poly models. But it's under heavy development, so these things are changed soon. Not anymore. Beta3 was the last release based on q1 bsp format. Last edited by predator on Sun Jun 18, 2006 11:28 am, edited 1 time in total. At the risk of digression, can anyone explain single cell texturing? Is that something that might be useful to transfusion?